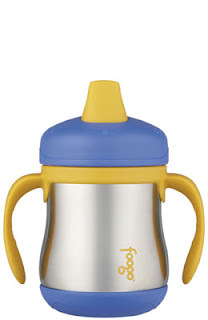 Consumer Service/Quality Assurance Manager quickly responded to my inquiry with, “The Foogo Sippy Cup liner is made of SUS304 Stainless Steel, which is the stainless that Thermos LLC uses on all of their products. The plastic used for the lid is polypropylene, recycle symbol 5, which is BPA free.” Foogo products are not available yet. The sippy cup is suppose to be on the market at the end of March (isn’t that now? ), and the full line will be out in July. It appears the sippy cup will retail for $15. We’ll keep you posted. For more information, click here. You can also read about it on nursery.apartmenttherapy.com. Hello. I didn’t know exactly where I could ask this question, so here it is. Have you ever heard of the brand “Fridge-to-Go”? I’ve been looking for a lead-free lunch bag/cooler and I saw the Fridge-to-Go brand in Bed, Bath & Beyond. I like the concept and the size, but when I emailed the company about the lead issue, I got a very vague response. The man who emailed me back even told me I should go to their competitor California Innovations. If you know that the Fridge-to-Go brand is lead-free, I would appreciate the info. I don’t have any knowledge, and I am surprised the company gave you a vague answer. You could buy a lead test kit for about $5 and test it. It only takes a couple of minutes to test and does not ruin the fabric. Does anyone else know about this product? Also, I just recently bought my son a straw “cup” from Thermos. It’s not the Foogo though, it is called a “funtainer”. They have designs on them (my son has one with Spiderman & one with Lighting McQueen from Cars). They are EXCELLENT. Stainless steel exterior & interior and the top is #5 plastic. It really keeps his water and his milk cold for hours (we were out for about 6 hours the other day). I bought them at Target, and obviously, they are on the market already. Yes any information anyone has would be appreciated. I did look into Mimi the Sardine and the Cooltotes brands, but I found them to be too small for me. Also, just an FYI…I just bought my son 2 Thermos brand straw cups called the “Funtainer”. His has Spiderman & Lightning McQueen on them. They are stainless steel inside and out and the top is that #5 plastic. They REALLY do keep the contents of it cold. I keep organic milk in one and water in the other. I think the Foogo is the same. prop 65 is the standard that is used when measuring lead content. this std. was established by California and in most cases is the std used by retailers when accepting product to sell on their shelves. I would recommend that you purchases another style of lunch bag our competitor California innovations. The above is the response I got from a representative of the Fridge-to-go company. Pretty vague right? Is he saying that it is lead-free or that it isn’t so I should go to the competitor? Maybe this guy is just being a jerk?? I don’t get it. Thank you for all your comments! I think the company representative was trying to tell you the product contains lead without saying it blatantly and getting into trouble. That’s how I read it. He recommends a competitor’s product, which is rare in the capitalist business world, which is why I am suspicious. Good luck! Reusablebags.com offers many great products that are lead free, and they are a really great company. Does anyone know if the thermos sippy liner is coated with epoxy? I’ve read where some stainless steel containers will have this coating added. Klean Kanteen does not use a liner on their stainless bottles, and you are right to avoid the epoxy. A friend gave us another brand that had an epoxy liner. It smells and is gross to use. I have read that the epoxy can contain BPA. I think the Thermos rep. told me that there is no liner, but you can email them via this webpage. They responded ot me quickly. Also, you could just look inside to see, if the store packaging will allow you to do that.